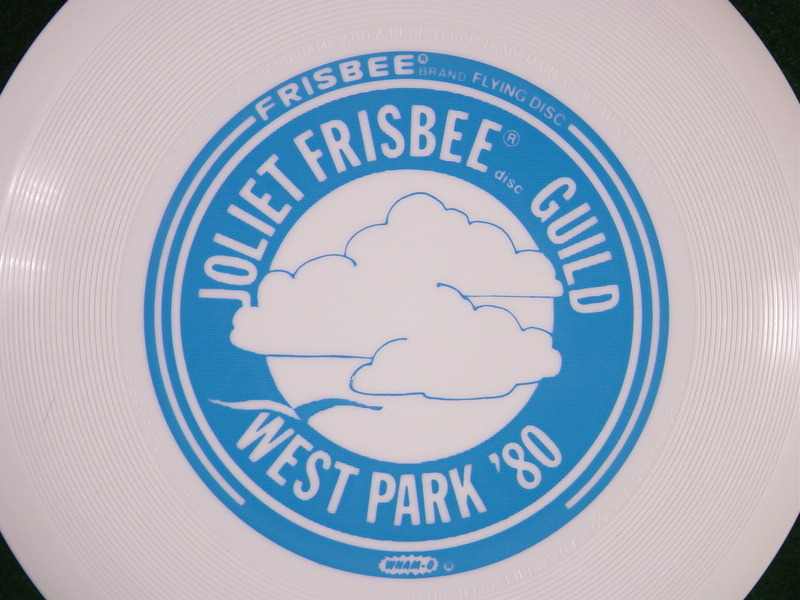 Paul McCallister (#1124) via the J-Town Disc Golf website takes us through the origins of disc golf in Joliet and how West Park became the first disc golf course in Illinois. Armed with an aerial photo and course overlays showing 18-hole feasibility, equipment cost, volunteer labor, non-interference with park use patterns, and a story about how the presence of recreational disc players would likely be a deterrent to littering and tend to keep bad elements away, McCallister gave his presentation and also mentioned that professional design and tournament certification were part of the purchase price. At the next regular meeting in February, 1979, the board voted to purchase equipment for an 18-Hold Disc Golf Course to be installed at West Park in the area used by McCallister’s designs with the exception that all fairways, tees and pole holes had to be located to the south side of the creek running through the park. This was because there was a possible plan to use the low area in the future as a storm water retention area. We agreed to prepare a re-design using the park area approved by the Board. The equipment was purchased in April and delivered in May. Ed Headrick contacted McCallister when the order was being processed to arrange being picked up at O’Hare and taken to the park. Ed tweaked McCallister’s design primarily by using the rocky dry rainwater runoff that became original fairway # 6. Ed sent the tournament certification letter to the Board. The Park District’s Director of Recreation set a target date of September for completion of installation. McCallister sent press releases to local and Chicago media. It was a one-round event with fivesomes and a shotgun start. Each player received a disc with $5.00 entry. The Joliet Frisbee Guild ceased to exist thereafter. By the next season McCallister began using West Park Flyers as a promotional name. The first PDGA tournament at West Park was on June 30 & July 1, 1980. It was held on a Monday and Tuesday immediately following the 1980 Chicago N.A.F.D.S. because so many traveling players would be in the area. 100 Pros played in the two day tourney which culminated in a 9-hold finale featuring the top 4 players in both men’s and women’s divisions. There was a total of $5,000 in prize money with 100 entrants at $50 each and matching funds from Wham-O through Ed Headrick. Chicago ABC TV sent a crew out to provide some coverage on Monday afternoon. In the following eight years McCallister played and promoted the sport of Disc Golf. He was involved in establishment and designs of New Lenox, Channahon and Shorewood. He directed more then 45 area tournaments including the first Illinois State and traveled to help players in other cities establish more courses.